It was “Meatless Monday” and the majority of my family was out of the house during dinner time, which allowed me to make any thing I wanted for dinner. I made the red, white, and blue quinoa I had picked up the other day, but had never tried. It’s actually called tri-colored quinoa. I wanted to add something sun-dried tomatoes. I also had an entire container of mushrooms calling my name, “Holly…eat us…no one else will.” I obliged. Call me a sympathetic, but when mushrooms ask for help, I answer. It’s actually a beautiful dish in real life. My youngest son is quite excitable, and when I said we were having quinoa he started chanting. “Keen-wa, Keen-wa, Keen-wa,” with fists in the air. I didn’t quite understand the excitement, but who am I to judge a half-naked toddler and his chants? I decided to join in (I kept my clothes on). Inevitably, he asked for cookies before dinner was completely eaten, and I found myself saying: “You can’t have any cookies until you eat your quinoa.” I had just unintentionally modernized the lyrics of Pink Floyd’s Another Brick in The Wall (“you can’t have any pudding…”) I was mad at myself long enough to make fun of myself and post it to Facebook, but I recovered. No Rowan, eat your dinner first. 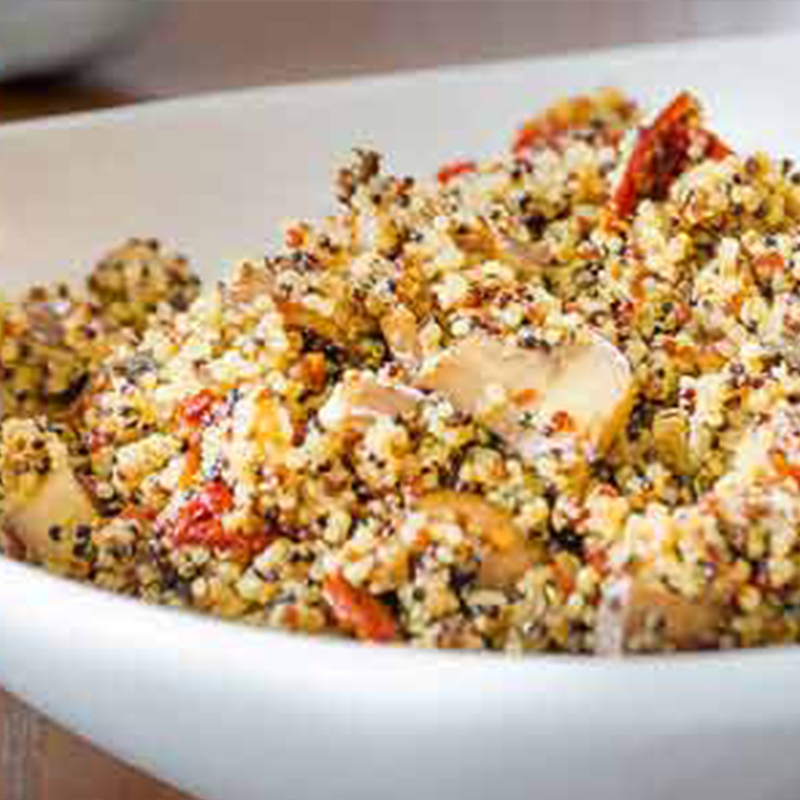 Red, white, and blue quinoa with sun-dried tomatoes and portabella mushrooms sauteed in olive oil with garlic and crushed red pepper. 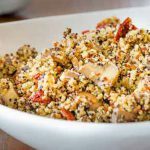 Prepare the quinoa as the bag suggests using vegetable broth rather than water; set aside. Sauté the minced garlic and mushrooms in the heated oil until golden brown. To the skillet, add the quinoa, tomatoes, Italian dressing, crushed red pepper, and salt. Turn the heat to low and cook an additional 2-3 minutes.